So much of what we see in the financial media is the celebration of success. The covers of Fortune, Forbes and Businessweek are more often than not adorned with the face of successful CEO or investor. Think Elizabeth Holmes, before the fall. However thoughtful readers recognize that BOTH skill and luck play a huge role in anyone’s success or failure. 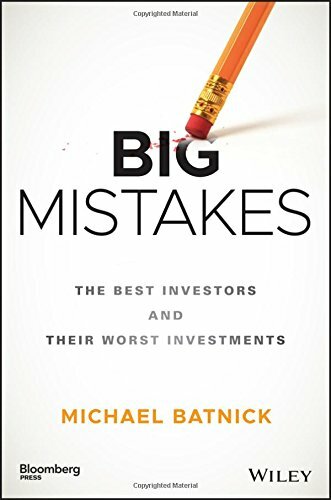 Speaking of failure, Michael Batnick*, Director of Research at Ritholtz Wealth Management and author of the Irrelevant Investor blog, has a new book out that turns the typical book idea upside. Rather than focusing on successful investors’, successful investments, he has written a whole book on successful investors’ worst investments. From Ben Graham to Chris Sacca, Batnick dives into the investments these investors would like to forget. As you will see below there are some interesting themes that can be teased from Michael’s book. Just like the book, Michael’s answers are illuminating and to the point. Below you can find my questions in bold. Michael’s (unedited) answers follow. Enjoy! AR: The Gerry Tsai and Michael Steinhardt chapters highlight just how moribund the investment industry was essentially from the end of the Great Depression to the 1960s. How do you think this fallow period affected how we think about investing? What does it imply about comparing returns over different eras? MB: Markets are like snowflakes in the sense that no two periods are exactly alike. Even if you’re comparing two markets that shared similar P/E ratios and interest rates, there are countless other variables to consider. What about where the economy is in the cycle? What about demographics? What about the geopolitical climate? Then consider all of the structural changes we’ve seen across time. From stock picking mutual fund managers to long/short hedge funds to ETFs and index funds. Consider the shift from defined benefit plans to defined contribution plans. Think about the birth of the retirement account and instant access to data. And think about the nature of data itself. Does the proliferation of data change its meaning? Finally, it’s important to understand how random markets are, and that the past is just one version of what could have been. It’s tempting to make comparisons because it makes us feel like we have some guide to the future, but the most important thing we should learn from studying history is that nobody ever knew what lay ahead. AR: The Jesse Livermore and LTCM stories couldn’t be more different but they both highlight the use and abuse of leverage. Can you talk about leverage and how it magnifies our inevitable errors? MB: Leverage is a dirty word because the LTCMs of the world that so easily come to mind. However, there are plenty of firms and strategies that use leverage responsibly, but because they haven’t blown up, we haven’t heard about them. That said, I can’t imagine any reason why the average market participant needs to use leverage. Investing is difficult enough as it is, no need to make it any harder. AR: Everyone in your book does at the very least have an above, if not high, IQ. However that did not prevent them from making investment mistakes, for example the Bill Ackman and JM Keynes chapters show. Can you talk about how humility trumps IQ? MB: Humility and discipline are far more important than vision and intelligence. There are so many smart people in the markets competing with each other second by second. Their intelligence cancels out, and the only edge that’s left for normal people is patience. If you can’t control yourself, you’re not going to achieve anything other than frustration and disappointment. AR: Another thread from you book is that is difficult to get sucked into manias. Buffett’s avoiding the Dotcom bubble is an aberration compared to Stanley Druckenmiller’s bet on Verisign and John Bogle’s disastrous tenture at Wellington. For someone who has never experienced a bubble firsthand, can you talk about how vulnerable we all are to seeing other people make big money? MB: I don’t know if there are any practical ways to insulate yourself from the normal human feelings that we all share, sociopaths aside. If you absolutely cannot help yourself then just keep the speculating to a negligible dollar amount. Although, if you happen to triple your money, you’re going to beat yourself up for not buying more, and then maybe you double down at the wrong time, like Druckenmiller did near the apex of the tech bubble. Like I said, protecting yourself from yourself when everybody is seemingly getting rich is exceedingly difficult. Surviving a bubble is in many ways harder than surviving a meltdown. AR: You make the point that talking about losing trades and investments is really difficult for people. Do we have to be uber-successful investors like Chris Sacca to be able to talk about our big mistakes? MB: Well, no. I am pretty open about my lousy investments and I’ve never been accused of being an uber-successful investor. I enjoy hearing about other’s early experiences. Too many people are just completely full of it, so it’s always a breath of fresh air to hear real talk from real people. AR: In today’s society we celebrate the entrepreneur who garners a big, successful exit. Oftentimes these people are set for life financially, but they have to ‘stay in the game.’ Your chapter on John Paulsen is a perfect example of why we can’t just walk away. Is this a feature or a bug of our system? AR: It’s very hard to walk away. Steinhardt and Lynch did, but that’s about it as far as I know. I’m sure there are others, but there are far more billionaires that continued playing than quit cold turkey. Past a certain point, $10 million, $50 million, whatever the number is, these people are playing for pride. Why else would somebody who has more money than they can ever spend not retire? Sure they love the game, but the part of the game that they love is winning, which is driven by ego. AR: I don’t think I’ve ever seen the term ‘de-compounding’ used before. What is it, and why is the compounding process so fragile? MB: De-compounding is anything that takes you off the path of compounding, and that could be different things for different investors. One of the most dangerous parts about making a big mistake, aside from the obvious monetary loss, is that they have a profound effect on your psyche. We might talk about our winners publicly, but internally, it’s the mistakes that we carry with us. And if you do make the big mistake, you’ll forever feel that the market is out to get you and you’ll say things like “just my luck.” Everybody experiences drawdowns, but it’s important to stay away from behavior that will de-compound our ability to accomplish what we want in markets and in life. *Conflict alert: Michael is colleague of mine at Ritholtz Wealth Management.